An infusion of coconut water hydration delivered in a lightweight spray. You can purchase the limited-edition†† Mary Kay® Collection Bag for $5 when you purchase $56 suggested retail (excluding tax) in Mary Kay® Fall 2018 Collection products. A reviving, wake-up-your-skin step you won’t want to skip. 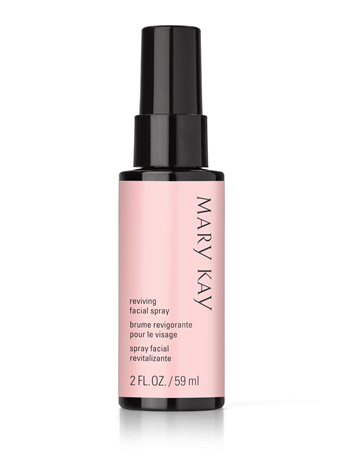 Mary Kay Reviving Facial Spray™ by Skindinävia provides an instant burst of moisture your skin is going to love. Infused with coconut water full of electrolytes, vitamin B3, a trio of minerals and an energizing coconut scent, this lightweight spray is the perfect addition to your skin care routine. Use to awaken skin in the morning before primer or as an all-day pick-me-up for the refreshed feeling you need to face any activity! Just carry the portable, powerful spray with you as you go about your day for an anytime awakening and boost of dewy moisture. Wondering when is the best time to spritz? Shake bottle well. Close eyes, hold 8 -10 inches from face, and mist lightly two to four times in “X” and “T” formations. Coconut water full of electrolytes, vitamin B3 and a trio of minerals pack this hydrating spray.